Zind Humbrecht has for long been one of the leading lights for biodynamic wines, rich, fullbodied, yet balanced – and wonderful for the season that’s now approaching. The company was set up by the Zind and Humbrecht families in 1959. Today it is represented by Olivier Humbrecht who sees himself in a father-to-son tradition that goes back to 1620. In total the domaine has 40 hectars under vine and has been biodynamic certified since 1991. Since 1992 it has been located just outside Turckheim, on the Colmar side. They prefer long growing periods to achieve ripe and concentrated grapes, often with botrytis that gives sweet, exotic aromas. Fermentations are slow, and the minimum of time spent on lees is 6 months. The result are very impressive, intense, rich, alcoholic wines, often with residual sugar, that nonetheless keep the characteristics of their different vineyards. They will keep, and they will “dry up” after some years in the cellar. Last year I tasted the 1989 version of this week’s wine, a wine in excellent condition. 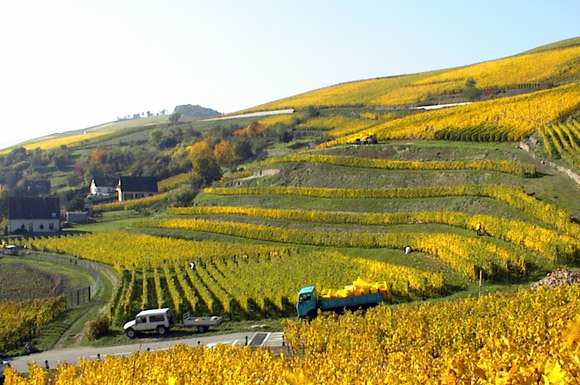 The Jebsal is one of the steepest vineyards in Alsace with a surface of 1.3 ha. south-exposed in the commune of Turckheim. It lies on grey marl limestone, rich in clay and gypsum, with numerous terraces. At a time abandoned and divided into many smaller plots, Leonard Humbrech managed to restore it in 1982. It was then planted with pinot gris, and the first vintage to be bottled was 1987. Despite the ability to produce sweet, botrytised wines (in fact all vintages have been sweet, most often a vendange tardive) this vineyard also is the first in the domain to see flowering and véraison (the changing of colour, beginning of ripening), and thus produce wines often characterised by cool soils. The soil has a good water retention capacity and prevents stress, so it can yield wines with a natural balanced acidity. 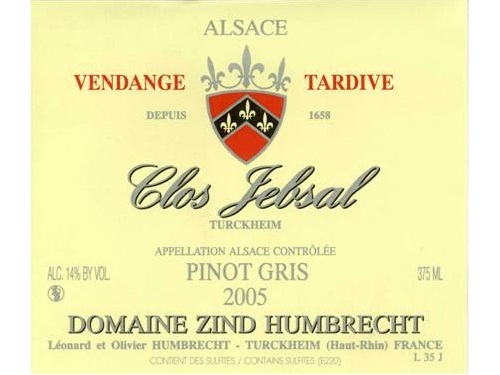 Pinot Gris Clos Jebsal Vendange Tardive 2005 (Zind Humbrecht) 37,5 cl. Yellow-gold colour. Aromas of orange, herbs, dried fruits, honey, and a touch of smoke. Very intense and (I would say) moderately sweet, but the acidity comes out after a while. A concentrated, flinty and very long aftertaste. I admit it, I was no fan of the Nouveau releases when the craze was at its peak in the 1980s. Nowadays I am much more geared towards the wines from southern Burgundy, and I rarely miss the opportunity to taste some new releases from Beaujolais. Here is my favourite among the wines I tasted yesterday. The legendary Marcel Lapierre was there when it all started. He passed away in 2010, but his widow Marie and son Matthieu continues to give us one delicious wine after the other. The label for this wine has been drawn by Maurice Sinet, of Charlie Hebdo fame. I just came to think of it, in these days when we cry for Paris again. Light red. Fresh in the strictest sense, flowery with raspberries and cherries. Soft on the palate with just the right touch of acidity. Just lovely. It was in the latest edition of our local wine club that we found many interesting US wines, for me especially reds, and a rosé. Some of the stars were the light, elegant Californian reds from Anthill Farms (Anderson Valley and Sonoma Coast) and Copain (Anderson Valley) that we have known for a while. But that night’s revelation was a darker, and maybe more complex wine from Oregon. Cristom dispose of several vineyards with highly different characteristics. From these they elaborate both single vineyard wines and blends. My local shop has more of the singular wines, so I have probably already been back there by the time you read this. All their vineyards are LIVE (low input viticulture and enology) certified, but they see far beyond their own vines as they also work with the authorities for the healthiness of the state’s rivers and watershed. The Jessie Vineyard (named after one of the owners’ grandmother) is one of the steapest in the Willamette Valley, and one of the most varied in soil composition, including five different volcanic soils. There is also the so-called “jory”, a typical Willamette soil, a deep, well-drained, silty clay loam soil from igneous bedrock. Quite dark, deep red. Ripe red fruit, cherrie, flowers, mushrooms, a bit earthy. A full mouth-feel, a vibrant acidity that contrasts with the ripeness of the fruit and great lenght. Fresh, appealing rosé wine that costs “no money”. Made from corvina (80%) and molinara, and made in the stainless steel low temperature fermentation tradition. Light salmon pink. Discrete notes of red fruits, apricots, and lime. Dry, yet with a smooth texture, quite full on the palate.